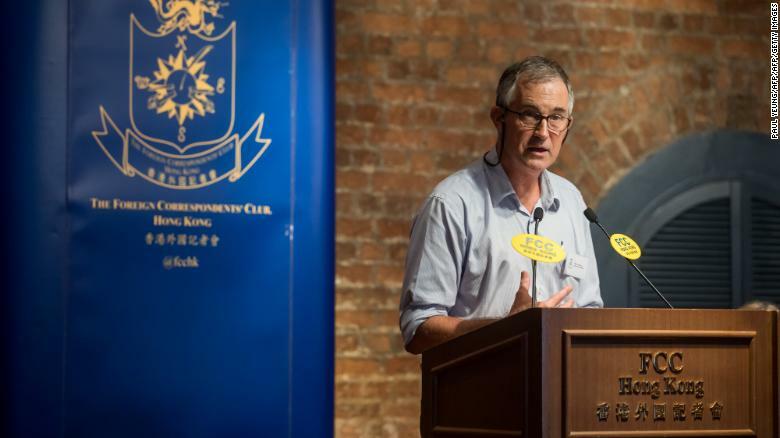 Victor Mallet speaks at the Foreign Correspondents Club of Hong Kong ahead of a talk by Andy Chan, founder of the Hong Kong National Party. Mallet has since had his visa denied by city authorities. 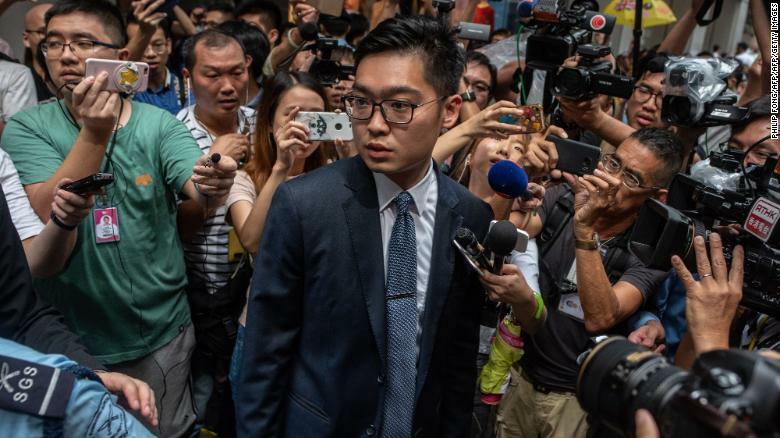 The unprecedented denial of a visa to a Financial Times journalist “sends a chilling message to everyone in Hong Kong,” the paper said Sunday, as press groups and politicians in the city continued to denounce the move. Asia news editor Victor Mallet was informed Friday that his visa renewal — usually a procedural matter — had been refused, weeks after he hosted a controversial pro-independence activist in his role as vice president of the city’s Foreign Correspondent’s Club (FCC). A huge amount of pressure was applied to the FCC by both the Hong Kong and Chinese governments to cancel the talk by Andy Chan, founder of the Hong Kong National Party in August. The Hong Kong National Party has since been banned — itself an unprecedented move — though it was completely legal at the time of his speech. Ahead of the speech, former Hong Kong leader CY Leung urged the government to investigate the FCC’s lease of its central Hong Kong headquarters, while China’s Ministry of Foreign Affairs called it an “abuse of freedoms of press and speech,” and accused the FCC of endorsing Chan’s views. “Without Mallet, Hong Kong won’t have any less freedom of speech. By contrast, Mallet’s action damaged China’s national security and undermined freedom of expression,” the paper said. It also linked the issue to ongoing US pressure on Chinese state media. Andy Chan (C), founder of the Hong Kong National Party, is surrounded by members of the media as he leaves the Foreign Correspondents’ Club (FCC) in Hong Kong on August 14, 2018. “Hong Kong’s high degree of autonomy and its press freedoms are central to its way of life, and must be fully respected,” it added. Press freedom groups will deliver a pair of petitions demanding an explanation to the Hong Kong government on Monday. Around 15,000 people had signed the two petitions as of Monday morning. “Refusing a visa in this case, to a bona fide journalist working for one of the world’s leading newspapers, sets a terrible precedent for Hong Kong’s reputation as a place where the rule of law applies and where freedom of speech is protected by law,” the petition said. Mallet was out of the city when the news of his visa denial came through. He returned to Hong Kong late Sunday night on a tourist visa, declining to comment on the issue when asked by local media. In a statement, the FT said he was only given seven days leave to remain in the city, even though British visitors typically receive six months. “Immigration officials did not provide an explanation for the shortened visitor visa, and we continue to seek clarification from the Hong Kong authorities about the rejection of his work visa renewal,” a spokeswoman for a paper said. 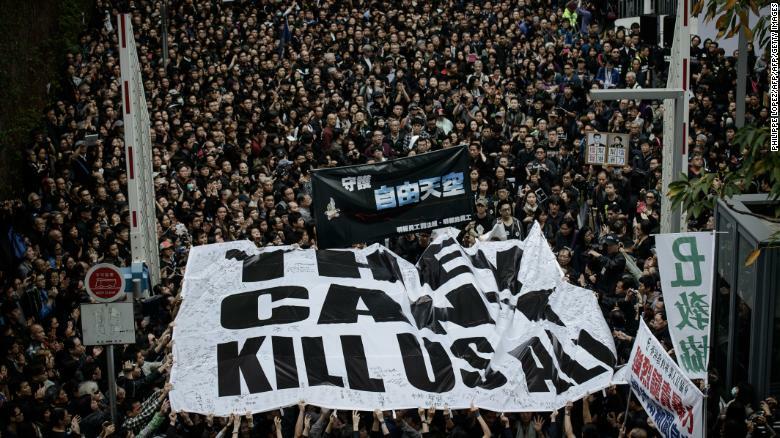 Protesters display a large banner during a rally in March 2014 after attacks on journalists. The city has long had a strong commitment to press freedom. The news was greeted with alarm by journalists and media organizations in Hong Kong, which has long boasted of its strong protections for press freedom and speech in comparison to China. In the past, journalists expelled from China have relocated to Hong Kong, including employees of the New York Times, a spokeswoman for which cited the city’s “commitment to freedom of speech and rule of law” as a reason for being based in the city. There was widespread speculation within the journalist community that the denial of Mallet’s visa — which comes amid a general decline in freedoms in Hong Kong — would see more organizations avoiding the city in future, choosing to base themselves elsewhere in the region. According to former employees, Time Asia was once considering a move to Singapore, but chose to remain in Hong Kong due to the more favorable legal environment. Last year, Reporters Without Borders opened its first Asia bureau in Taipei after abandoning plans to be based in Hong Kong, citing deteriorating press freedoms. CNN and its parent company Turner Broadcasting both operate large offices in Hong Kong. Representatives of the two companies declined to comment about any concerns raised by Mallet’s visa denial.